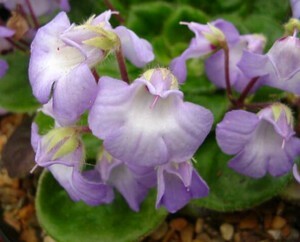 Petrocosmea is a small genus of rosette plants which are sometimes referred to as tender alpine species. There are varied sizes of plants and shapes of leaves and flowers. This genus contains over 47 species, but not all of them are in cultivation. Only about 19 species are thought to be in cultivation, plus several variants. Of those known species, 40 are native to China, where the genus is called “Pinyin”, meaning “The Stone-Butterfly genus”. They are also found in northeast India, Myanmar (Burma), Thailand, and southern Vietnam. Petrocosmea was first discovered in China by Augustine Henry and described in 1887 by Daniel Oliver, (Prof. of Botany, University College), London. He adapted the description based on Latin scientific names of the Greek words for “pretty” and “rock”, arriving at the name Petrocosmea. Most are found at higher altitudes in southern China growing on limestone on shaded rocks in hilly areas at 400-1700 m. Some have been found growing in wet, mossy forests. They prefer cooler temperatures and will grow well in a cool basement, on a windowsill or under artificial lights. A degree or two of frost may be tolerated if grown in a cool alpine house. Those growing at lower altitudes can tolerate warmer temperatures. Some species are extremely slow growing. They have been described as epilithic (meaning they grow on rocks) and may take many years to grow into a mature plant. Fast draining, light soil mix in shallow pots or pan pots is preferred. Moist or humid air allowing for drying out between watering will help prevent rotting. Infrequent re-potting works best, as they don’t like the roots disturbed very much. Blooming is usually seasonal in the late winter/early spring. Flowers are suspended on long pedicels with flower colours ranging from white/cream, to blue and purple. Most species have single blossoms, but advances in hybridizing has produced semi-double to double blooms.